Hi, do you do drum units for Oki MB491 printers? A flexible all-in-one unit suitable for office use, the Oki MB491 is the best multifunction printer to have in a busy work environment. The Oki MB491 printer is built for shared use and offers high-performance printing, copying, scanning and faxing, with an impressive print rate of up to 40 pages per minute. The Oki MB491 all-in-one printer even offers maximum print quality up to 1200 dpi, while also providing flexible media handling. However, the MB491 printer can only produce monochrome outputs and may not be very efficient for high-volume printing, with its meagre 350-sheet paper capacity. The Oki MB491 A4 mono all-in-one multifunction printer adopts the same design as the previous multifunction models from Oki. It has a 50-sheet RADF unit on top of the high-resolution scanner and copier, while the automatic duplexer allows convenient printing of double-sided documents. The MB491 mono laser printer MFP features good connective options, including a USB port and a LAN port for networking. Versatile enough for any kind of workgroup, the Oki MB491 can be used with most Windows and Mac computers. One of the best advantages of the Oki MB491 multifunction printer is its ability to forward the fax messages it receives to email addresses. This makes document transfer very convenient. 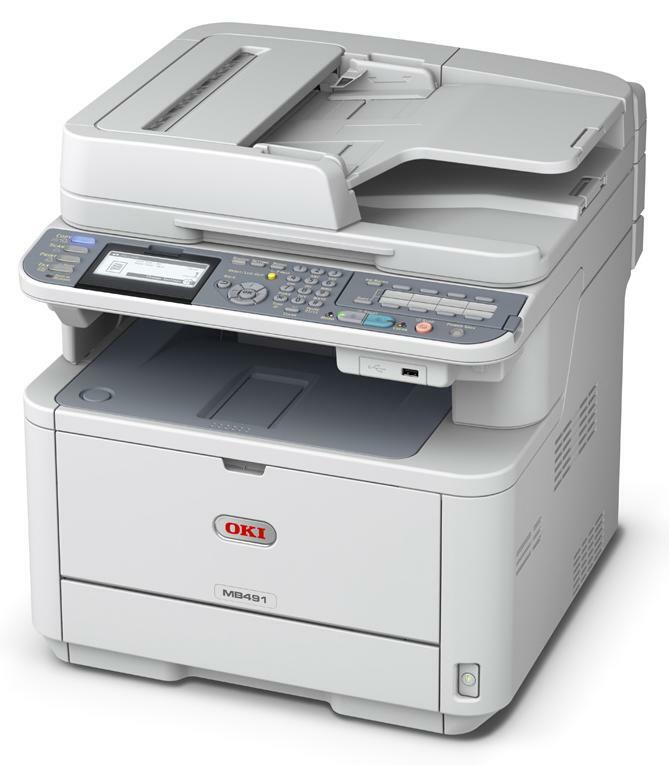 Additionally, the Oki MB491 laser printer offers document encryption for added security. It has an intuitive user interface and fast speed of 40 ppm. With the option to use a high capacity black Oki MB491 toner, this machine has more affordable operating costs than some of its predecessors. However, the Oki MB491 A4 printer is still limited to monochrome printing and it is only suitable for low to mid volume printing because of its low paper capacity. Otherwise, the Oki MB-491 is a good choice of office printer for workgroups.